We have three boats running out from Divers Down. Please see further down the page for a full list of dives. 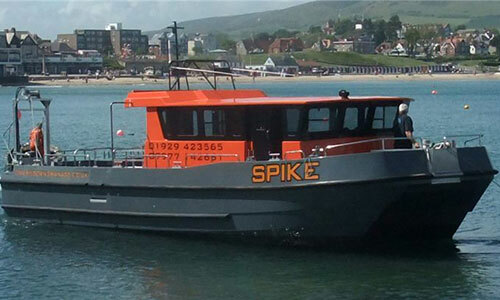 We have three South Boats Catamarans called Swanage Diver, Skua and Spike! All our boats have rear diver lifts fitted to make your dive as easy and pleasant as possible and large twin engines to get you to and from your dive site quickly and safely. 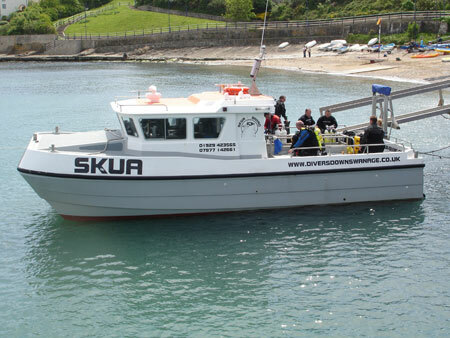 The boats take up to 12 divers and will be operating all summer, going to all the local wreck and drift sites. But we can go to any site within our range, by request, if you have a group of six or more. 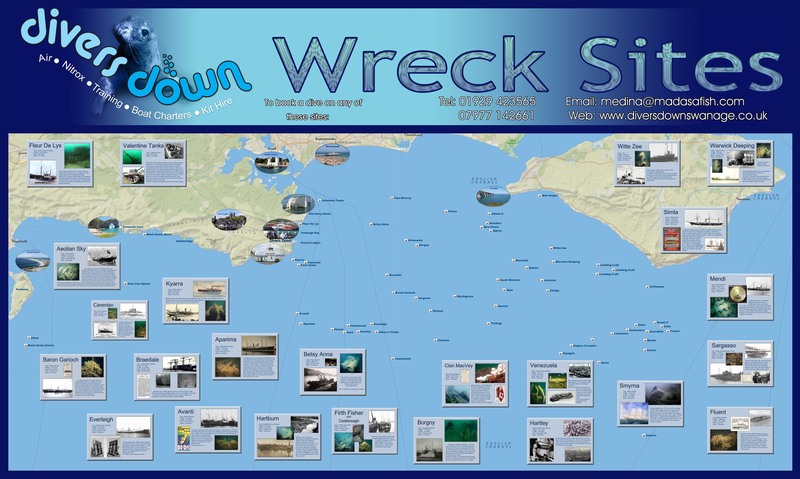 Here are Details of some of the Dive Sites we visit. 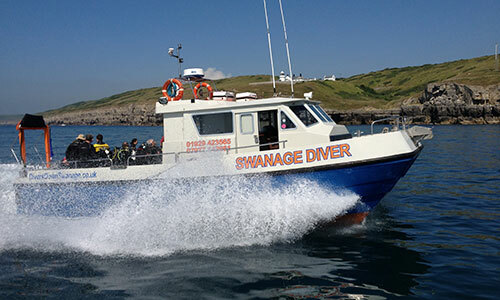 We are now taking bookings for the whole of the 2019 season and you can see more dives on our online booking system. We will still also be operating our normal shuttle service on these days. If you don't see what you want then just contact us to see what is available. Phone or Text: 07977 142661 or email: medina@madasafish.com for bookings for the rest of the year and enquiries. All Boats have rear diver lifts for your comfort and convenience and will serve hot drinks on your return journey. You can Park, Get your Air & Nitrox and your Boat all on Swanage Pier. The Skippers are responsible for safety of all passengers and crew while on board the vessel, and will keep a list of names with contact details for all divers on board. Divers are responsible for their own diving equipment. The Skipper does not accept responsibility for loss of or damage to passengers' gear, property or valuables whilst on board or in transit, these are the responsibility of the individual and should be on their own insurance cover. Divers are responsible for the possession of a current diving qualification appropriate to the planned dive and valid certification of medical fitness to dive. Divers must ensure that each individual member of the party carries adequate insurance, or in the case of a Club, ensure adequate Club insurance for the area and the type of activity to be engaged in. Divers Down has 3rd Party Public Liability insurance, but divers are reminded that this insurance does not cover them when diving. Divers must ensure that they conduct themselves according to the Code of Practice for Safe Diving, before, during and after the dive(s). Provision of sufficient instructors and/or other competent persons, should it be necessary, to supervise all diving activities and the use of diving equipment is the responsibility of the groups or individuals not Divers Down. The Skipper and Crew shall not be responsible for any accident or injury caused to any person or persons arising out of diving or use of any diving equipment. The Skipper is not responsible for warranting the safety of any wreck or dive site; or marker lines or floats. The Skipper may advise on matters of seamanship considered relevant to the planned dive (e.g. changes in sea state, surface visibility, tides). If necessary, the Skipper has the authority to terminate the dive or suggest an alternative where sea/weather conditions or forecasts are considered unsuitable. Divers are responsible for keeping adequate logs of their dives to assist in the event of a diving incident. Safety procedures must be observed at all times. The Skipper's decision on the day is final in all matters relating to the vessel. The skipper will give a detailed safety brief on the dive site, entry and exit procedures relevant to the boat used. Instructions or advice given by the Skipper or Crew on matters of safety must be observed by all on board and clients must, at all times, take all reasonable precautions for their own and others safety. Neither the Skipper nor Crew accept any liability for any accident or injury incurred by any passenger on board the vessel engaged in fishing, angling, diving, sightseeing, photography, filming, whilst in transit or similar activities, caused by the actions of any other passenger on board. Prices for diving are as advertised on the web pages. The booking is for a space on the boat. Should the diver for any reason chooses not to dive this is the divers decision and not grounds for refund. Any diver wishing to cancel a booking should give Divers Down as much time as possible to resell the places. This is normally not a problem but the more notice we have the more chance we can resell. Places booked within one week, or divers cancelling within one week of the dive date can not be cancelled and must be paid for unless the places are resold. For whole boat bookings 30 days cancellation notice is required in writing and confirmed by ourselves. Under 30 days notice Divers Down will endeavor to resell the spaces. Should this not be possible the person making the whole boat booking will be asked to pay for unsold places. Credit card details are taken to confirm bookings. Divers Down will not normally take any payment from that card but It may be used to gain payment from divers not showing for dives. Card details are kept in a secure safe and destroyed post booking dates. The person who provides contact or credit card details to make a booking, whether as an individual or on behalf of a group, is the Client responsible for the whole of the fee he/she has undertaken to pay. We reserve the right to alter prices in accordance with any major changes in costs, which may occur between the time of the booking and the time of departure. While every reasonable effort will be made to ensure quality charters for the client, we do not accept any responsibility for any circumstances outside our control, e.g. tides and moon phases, poor diving visibility and weather conditions amongst others. When full payment has been received and the skipper cancels the trip monies will be refunded or carried over to a future date. Where the vessel is chartered to dive for a specific purpose and weather or other conditions on the day prevent this, the Skipper will make every effort to provide a safe alternative trip, and the client shall have no further claim against us. Clients must refrain from throwing rubbish overboard - the Disposal of Garbage at Sea Act makes this an offence. Any breakages, loss of equipment provided or damage caused on board as a result of client's misbehavior, irresponsibility or carelessness will be charged to the client. If any passenger is found to be in possession of anything illegal; or engages in behavior causing danger to themselves or other persons or property on board including consumption of alcohol. He or she will be put ashore at the first opportunity and the Authorities notified as may be necessary. Any such passenger(s) shall free and release the vessel owner / skipper from any liabilities, incidental costs or responsibility arising out of any breach of these conditions. The Skipper reserves the right to accept or refuse any charter. Both boats have rear diver lifts and hot drinks will be served on your return journey. Park, get your boat, your air and your nitrox from Divers Down, all on Swanage Pier.